Slimming World Diary: Frozen Soup Cups & Bolognese .. I made gorgeous SW syn free mushroom soup today, I had plenty left over so had to freeze some. 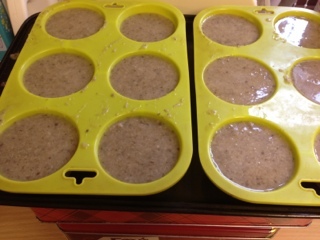 My friend and Slimming Worlder Gemma informed us of this great idea of pouring the soup into flexible silicone muffin trays, then putting these in the freezer, once frozen pop them out. I put mine into freezer bags, and put back into freezer. 2 cups should be enough for a bowl, so just heat up when you want. Such a great idea. This soup recipe is really easy and tastes delicious. 1. Fry onions and mushrooms until softened. 2. Add stock and bring to the boil. 3. Reduce heat and simmer for 10 minutes. 4. Remove from the heat and blitz with a hand blender or food processor. 5. Add the fromage frais. 6. Blitz again, and serve. Tonight for dinner I tried a new recipe of Bolognese Pasta Bake, and I'm glad I did because it was delicious! Really tasty and filling. This is 2.5 syns on Extra Easy. Unless your using your Healthy A for the cheese. I had mine with a Weight Watchers petit pan (free if using it as your Healthy B) but you could have some greens instead, or it can be a great meal on its own. Here's the recipe. 110g reduced fat mozzarella cheese, diced. 2. Cook the pasta until al dente (tender but still retaining a bite). Drain well. 3. Place the onion, celery, carrot, garlic, mushrooms and minced beef in a large non-stick frying pan and stir-fry over a high heat for 6-7 mins. 4. Add the tomatoes, stock and oregano and bring to the boil. Season well, cover and cook over a medium heat for 20 mins, stirring occasionally. 6. 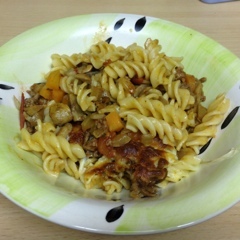 Spoon half of the bolognese mixture into the base of a medium-sized baking dish and top with the cooked pasta. Spoon over the remaining mixture and sprinkle with cheese. 7. Bake in the oven for 25-30 mins or until bubbling. Remove from oven and serve. Got to love a soup cube or two!